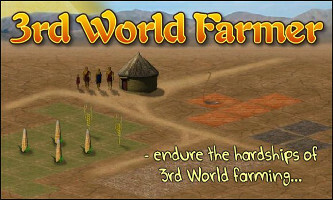 3rd World Farmer is survival role-playing online game which gives a striking, first-hand insight into extreme rural poverty, and the hardships and challenges faced by the millions of starving, struggling farmers and families of developing nations. In the game, the player gets to manage an African farm and is soon confronted with the difficult choices that poverty and conflict can cause. Build sheds, buy cattle etc. to produce the best profit. Send children to school, buy medicine when needed. Survive political changes, raids and other obstacles. Created to spark discussion about 3rd world and problems people from Africa have to face every day. Experience every day 3rd world hardship in a safe environment. Learn about obstacles of the poor, which, in turn, will spark reflection and discussion about solutions to those problems. Make positive social changes, such as building networks and organizations that help people in 3rd world countries, and sparking interest in similar topics throughout developing countries. Developed as part of students’ project at the IT-University in Copenhagen.